The initial visit (1.5 hours) will include a comprehensive health history and a treatment tailored to the client’s needs. Subsequent sessions of 1 hour will include checking client’s status and the practitioner’s choice of modalities including the use of other treatments such as a moxa, gua sha, cupping and herbal medicine. A form of herbal heat treatment that uses mugwort (Artemisia vulagaris) to stimulate specific acupuncture points of the body. A healing technique that involves scraping or rubbing the skin in order to bring the heat up to the surface (sha). This breaks up any stagnation and helps to alleviate pain. An ancient healing tradition that using glass cups, heated to produce suction on the skin to draw out toxins, relieve pain and improve circulation. Facial Acupuncture is an anti-aging non-invasive method for rejuvenating the face and revitalizing the whole body. Based on the principles of time-tested Chinese medicine, it involves the insertion of hair-thin needles in the face and other body parts. Reduces wrinkles, tightens pores, improves muscle tone and increases collagen production. Cost: One session for $125 or package of 10 for $115 per session. NeuroAcupuncture is a contemporary acupuncture technique integrating traditional Chinese needling methods and scalp Acupuncture with Western medical knowledge of neurology, neuroscience, and neurological rehabilitation. Neuroacupuncture is the most effective in the treatment of acute and chronic central nervous system disorders, such as spinal cord injury, MS, Parkinson’s, stroke recovery, TBI (traumatic brain injury), PTSD, pain management, to name a few. Each appointment begins with a detailed health history followed by a physical examination. Using traditional Chinese Medicine diagnostics, the practitioner will examine your tongue and feel the pulses of your 12 different body organs. Depending on your individual health needs, additional physical examinations may be performed, Using these various assessment tools, the acupuncturist will proceed with a unique treatment plan to address your particular condition(s). Lying comfortably on a treatment table, the practitioner will stimulate precise acupoints on various areas of your body, following what is know in Traditional Chinese Medicine as meridians. Most people feel little to no sensation as the sterile hair-thin needles are gently placed at these precise points. The needles are usually retained between 15-25 minutes. during which the practitioner exits the room, leaving your with some relaxing music. 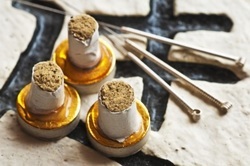 Most patients report feeling more relaxed and renewed during and after their acupuncture session.